The trace element chemistry of anoxic sediments and sedimentary rocks has previously been shown to correlate with the chemistry of the ocean (Algeo., 2004). Recent studies have used the trace element content of ancient sedimentary pyrite to track first order changes in ocean chemistry through geological time and display good parallels with traditional whole-rock methods (Large et al. 2014, 2015). However, no evidence for the possible diagenetic effects on the preservation of the authigenic seawater signal has been presented for this or other methods. Without the preservation of coeval seawater to offer a direct comparison, the possibility of diagenetic overprints requires that sedimentary pyrite analysis and other methods should only be considered semi-quantitative. The recent IODP Exp. 347 "Baltic Sea Paleoenvironment" offered an opportunity to bridge this current knowledge gap by evaluating the formation and chemistry of recent pyrite in a well-constrained context. The Baltic Sea Basin has experienced a varied history in the short time since its formation and has recorded a diverse series of environmental changes. Preserved in the high-resolution stratigraphy recovered during Exp. 347 are several sedimentary units which represent fluxes between a geographically and geochemically restricted water mass, freshwater, and brackish seawater, as well as the development of anoxic water column conditions. 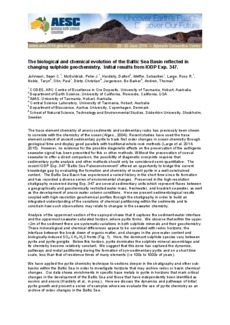 Here we present sedimentological results coupled with high-resolution geochemical profiles through the stratigraphy in order to build an integrated understanding of the variations of chemical partitioning within the sediments and to constrain how such observations may relate to changes in the seawater chemistry. Analysis of the uppermost section of the sapropel shows that it captures the sediment-water interface and the uppermost seawater saturated horizon, where pyrite forms. We observe that within the upper ~2m of the sediment there are systematic variations in both sulphide minerals and their geochemistry. These mineralogical and chemical differences appear to be correlated with redox horizons, the interface between the break down of organic matter, and changes in the pore water content and biologically-induced SO4-CH4-H2S fronts (Fig. 1). Here, the dominant sulphide species vary between pyrite and pyrite-greigite. Below this horizon, pyrite dominates the sulphide mineral assemblage and its chemistry become relatively constant. We suggest that this zone has captured the dynamics, pathways and metal partitioning during the formation of syn-sedimentary pyrite and on a short time scale, less than that of residence times of many elements (i.e 100s to 1000s of years). We have applied the pyrite chemistry technique to sections deeper in the stratigraphy and other subbasins within the Baltic Sea in order to investigate horizons that may archive redox or basin chemical changes. Our data shows enrichments in specific trace metals in pyrite in horizons that mark critical changes in the development of the Baltic Sea and those that have independently been identified as euxinic and anoxic (Hardisty et al., in prep.). Here we discuss the dynamics and pathways of initial pyrite growth and present a series of examples where we evaluate the use of pyrite chemistry as an archive of redox changes in the Baltic Sea.